Most people do not focus on wrists until they start causing some problems. Then it turns out how essential it is to have strong and flexible wrists. So, If you experience any pain or discomfort in your wrists either during the workout or after it, by all means, this article is what you need to read right now. But maybe your wrists are OK, and you figured you could skip this one. Not at all – you will find here helpful tips to prevent wrist injuries, along with some wrist strengthening exercises that may become useful as well. After all, if you are working on your upper body, every exercise that puts force through your shoulders puts the same amount of force through the wrists as well. 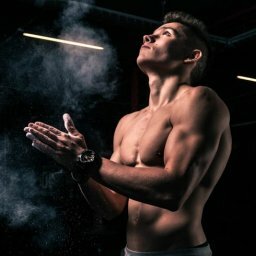 So, weak wrists may stop you from doing the exercises you want, not only such as hand balancing or other obvious ones but also push-ups or ring exercises. As for the last one, you will find here also some advice concerning the right way to grip a ring. But first, some anatomy. Yes, it is essential to know how the wrists are built and how do they work. It goes for every part of your body. To be honest – if you want to train your body, you have to know more about how it functions. That way it will be easier for you to do the exercises properly. So, let’s see how does a wrist look and function. First off all there are bones, ten to be exact. should be prepared for ligament sprain or bone stress fractures – in other words, nothing pleasant. That is why it’s so important to work on your wrist muscles and prepare them for some serious effort to come. Let’s do the wrists! Strengthening exercises. Do you wonder how to strengthen your wrists? Here are some examples of wrists exercises you can try. They may seem fun and easy but can put your wrist muscles to work. doing the exercise for a full minute straight. Of course. In the beginning, it can be too much for you, 10-20 seconds may be sufficient. But after a while, you’ll be able to keep the stretch longer. Go to the deep squat position (but remember to feel comfortable, do not strain yourself). Place your hands on the ground – left hand in front of right leg, right hand shoulder length away from the right leg. Press your hands into the ground and move both your legs simultaneously to the right so as your left leg lands behind your right hand. Go to the right few times, then switch direction. Again, try doing the exercise for one full minute and remember to go in both directions! Keep your focus on the wrists, over time you’ll see that you can put more and more pressure on them. And here’s a variation of the exercise above: again go to the deep squat position, but this time place your hands on the floor about 30 centimetres in front of you with hands just inside your knees. Press your hands to the ground and hop your legs toward the hands. Put your hands forward again and repeat the exercise. Focus on loading the wrists more and more. It’s a good exercise not only for wrists strengthening but also for hand balancing work. After you’ve decided to do some wrists strengthening, you may want to complete your wrists workout with some exercises that will give your wrists flexibility as well. Then you may proceed to the hand strengthening exercises and work on your hand and finger muscles AND wrist at the same time. Kneel on the floor and raise your hands in front of you palms up. Then roll your fingers down on the ground with your fingers pointed toward you. Splay your fingers out so the pressure won’t accumulate in one place but rather spread evenly. To avoid the elbows’ hyperextension, put them a bit closer together. Then start rocking your body back and forth, focusing on putting the force through the wrists. Do ten pulses, then hold the stretch for about thirty seconds. Do three sets of this exercise and rest for one minute between the sets. You can also do three to five sets of ten-fifteen reps with minute rest between the sets. That way this exercise will also work as a strengthening one. three sets with one-minute rest between them. You can also do three to five sets of tenfifteen reps, with a minute rest between the sets. Try adding a bit more pressure through the hands. stay focused on the way your weight puts pressure on the fingers, don’t just count the reps to make it over with, you have to fatigue your hand a bit to achieve best results. But when you feel the fatigue, switch into another position. Still in the same position, you can put the hands on their back and point the fingers toward each other. Lift the upper body up while keeping the back of your knuckles on the ground, then push the wrist to the ground while rolling it out. And again – with shifting your body forward you’ll add more weight to the pressure put on your wrists. And yet another variation of this exercise – this time put your hands on the floor with fingers pointing at your knees and start lifting up your body with fronts of you knuckles kept on the floor. The last three exercises are a very good transition to the wrist push-ups. You can do it all over again but this time with your legs in a push-up position. So, start with the hands palms down, and fingers pointing ahead, move to palms up, both hands’ fingers pointing at each other and end the exercise with your hands palms down and fingers pointing toward your feet. The exercises from point 3, 4 and five are pretty good for sore wrists. Of course – if you feel that your wrists’ condition may be serious or the pain won’t stop after some time, please consult the situation with your P.T specialist! OK. So what are all those exercises for? Among other things, strong wrists are needed when it comes to pull-ups, especially while using rings. Speaking of which it is necessary to know how to grip a ring to prevent your wrists from being injured. There are three possibilities: neutral grip, false grip and above the rings grip. Neutral grip: wrap your fingers around the rings and lock the grip with the thumb wrapped around the ring as well. Get below the rings and start pulling movements. Remember: most of the pressure should be placed right below your first knuckles. Do not flex the wrist during the exercise. False grip: use it when you want to muscle up. Place the rings around the mid-palm level. Wrap your fingers around the rings and thumbs around your knuckles. Push down into the rings, your wrists should be bent but not inside the rings. Maintain the false grip all the way throughout the movement – from the below the rings to the above the rings position. Above the rings grip: hold the arms by your sides, do not bend wrists either outside or inside the rings. Keep your wrists as straight as possible and push down into the rings to lift your body. And here’s when it starts to get more interesting. With your wrists strong and flexible you can try to do some awesome exercises, like a crow pose. Sit down on your knees, make a diamond of your hands and move them out shoulder length while putting them on a floor. Bend your elbows and put the knees on your arms, just above the elbows. Lean your head and shoulders forward and start rocking back and forth to find the balance. Start pointing your toes, first one foot at a time, then both of them. That way you don’t have to lift your feet up, and it’s easier to maintain balance. But of course, it’s not the end of the road. From the crow pose, you can go to the crane … straight to hand balancing exercises! Enjoy!